Days of the Dead Chicago starts Friday, November 16 and runs through Sunday, November 18. Leading up to this DotD event, I am running some of my fun moments over the years at their conventions. 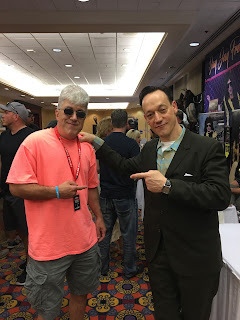 Ted Raimi is a director, actor, writer, comedian and just a fun guy. He's been in the Evil Dead franchise, Army of Darkness, the Spider-Man franchise and many more movies and tv series. He has been very active over his 40+ year career. I met him a couple times prior to this DotD, but I had the chance to chat with him a little more than usual in Indianapolis. We talked a bit about Ash Vs. Evil Dead, which also features Dana DeLorenzo (another of my favorites). Raimi said he has had a blast doing that series. It's a lot of fun and really has caught on with the fans. I asked him about his regular role on Xena: Warrior Princess and single episodes of other shows. Raimi seems to really enjoy acting, especially in roles which are kind of under the radar. He's such a great actor who can pull off a wide variety of roles. You can get more info on Raimi at TedRaimi.com. Check out DaysoftheDead.com to get all the info on the upcoming Chicago event. Once again it will feature a lot of great celebrities, including Clive Barker, Traci Lords, Trish Stratus, Lita and many other great names. Of course, I'll be there as usual. Ted Raimi and me in Indianapolis, IN-June 2018.